Team Q4 (minus Kamui), prepare for the the National Champion qualifying round. 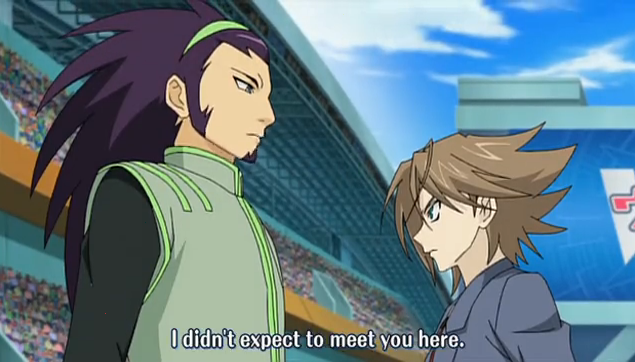 This was an interesting episode of Cardfight! Vanguard. The opening ceremony of the National Championship is over, and Ultra-Rare explain the process for the qualifying rounds. The various teams are divided into several “blocks”, each containing four teams. Only two teams from each block will be proceeding to the actual championship battles. The teams are selected by their cumulative score in a round-robin within the block to which they have been assigned. They are making a big deal of these matches. Aichi is facing off against team “Jurassic Army” in the first match, but they haven’t shown the conclusion, merely taking us to the point where the first grade 3 Vanguard has been stood up. Kai apparently has had a previous run in with the Foo Fighters. The bad news for Team Q4 is that the Foo Fighters, last year’s national champs, are in the same block. Unexpectedly we got a hint about Kai’s past. Kai knows the members of the Foo Fighters (including Ren Suzugamori, who doesn’t think the qualifying round is worthy of his participation). Kai insists that he “doesn’t remember what happened back then”. 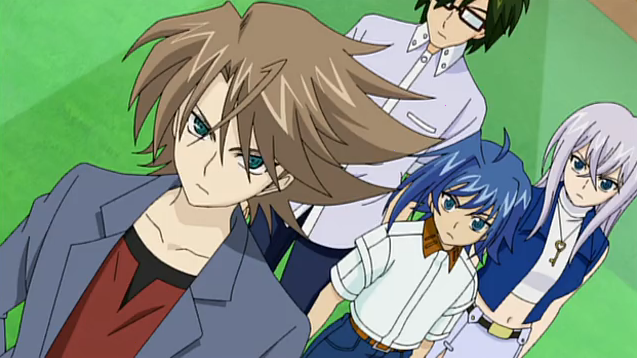 When Aichi tries to push it, Misaki stops him, saying that everyone has something they would prefer not to discuss. One notable thing about this episode is that they introduced a new way of presenting the duels. Instead of just showing the player’s avatars fighting on the mythical planet Cray, they are shown as if fighting on Cray, but within the stadium. Im so happy to see someone whose actually watching this show and seems to LIKE it. Most bloggers have commented on how much they dislike this one. I don’t know why people don’t like this show. It is fun and does its genre well. I think they dismissed it without really giving it a chance. Yeah. Personally, I just figure it is one of the genres, and let’s face it, there are plenty of genres out there that get used again and again. Saying, “Oh, noo! Another TCG anime,” while watching school-life comedies, or girls with guns, or RomComs, without acknowledging these are just as generic. Hell, Science Fiction is a genre, Western is a genre, and so is Trading Card Game. People need to get over it. Exactly, well said. People should learn to appreciate all genres and not be stereotypical towards a certain one and shun it aside.